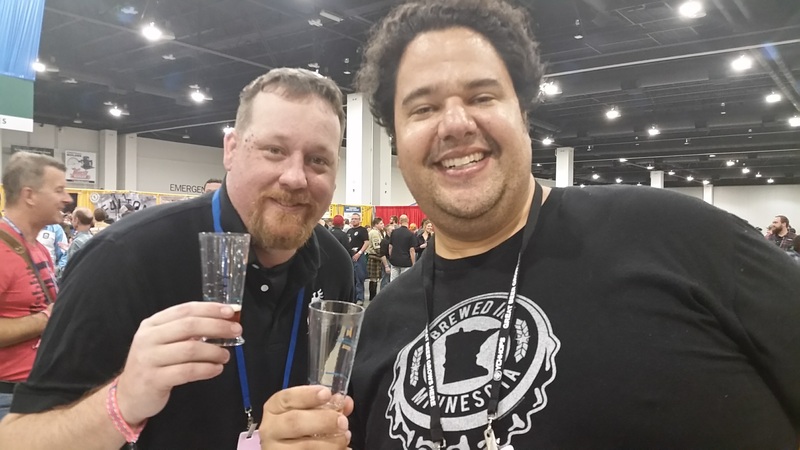 For years, I have watched with insatiable envy as countless friends and industry people enjoyed the Great American Beer Festival. Viewing status updates and tweets gave me serious FOMO (Fear Of Missing Out). I began wondering whether or not I would ever get out there myself to experience this incredible beer phenomenon. 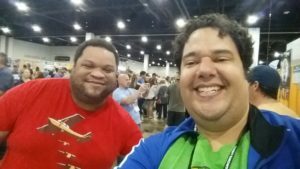 While on a beercation to Colorado in 2015, I learned that media members can get press passes to GABF. 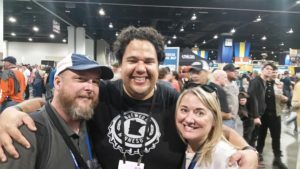 Ever since that little nugget of wisdom from Patti who does photography for Brewtally Insane!, a Colorado beer blog, I have been saving up my personal days from work to try to attend GABF. Then, last s ummer, Eric Wentling and I collaborated on a series of beers with one of our favorite local breweries, Lupulin Brewing Company. Matt Schiller and Aaron Zierdt, co-owner and head brewer, told us that they would be entering the Belgian Dubbel, the first beer in the collaboration series, into GABF. We felt a bit of added pressure to make the beer tremendous. 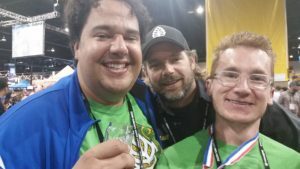 When Matt and Aaron asked us if we wanted to accompany the Lupulin Brewing Company team to GABF with Brewers Passes, we couldn’t say, “Yes,” fast enough. I took time off and booked flights faster than a beaver sneaking into an arboretum. As the dates for GABF grew closer, I started feverishly making plans. I knew that I had to get back to Fort Collins and Loveland. With limited time outside of Denver, I knew I would probably only have one night in Fort Collins. I also relied heavily on Jim Stroner, a local beer dude and one of the people behind the scenes at Tin Whiskers Brewing Company to give me hints on what to do. Jim is a seasoned veteran of the Great American Beer Festival and happily assisted me. The Great American Beer Festival (GABF) started way back in 1982 at the Harvest Hotel in Boulder, CO. That year, there were 24 breweries pouring 47 different beers and 800 people attended. 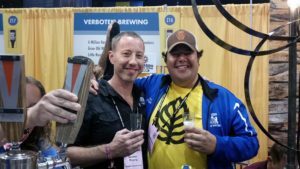 Fast-forward to 2017, and GABF has an astounding 800 breweries and over 60,000 attendees! The festival now takes place at the Denver Convention Center and over 3,900 beers are poured! To say that it has grown is beyond stating the obvious. 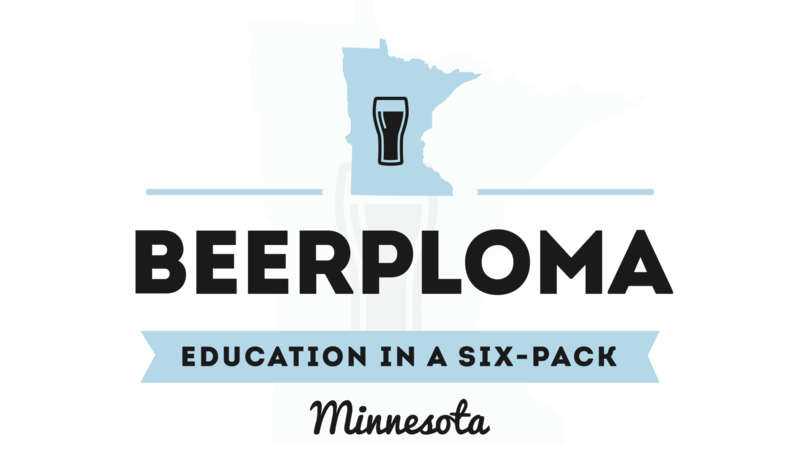 It is also, at its core, a beer competition. This year, over 7,200 beers competed for GABF awards. Now, some will say the festival has become too large and the competition isn’t a true measure of the best that the U.S. has to offer. I cannot speak to these concerns given that this was my first year attending. The size of this festival is absolutely massive. I know that being able to go to all four sessions is definitely an advantage. It is impossible to even scratch the surface of this event in one session. So, I recommend trying to get to as many of the first 3 sessions that you can. It took me almost a half an hour of walking around just to get my bearings. The festival is broken into regions of the country, which is smart. My plan was to use the GABF app and just focus on one region at a time. I started in the Mid-Atlantic region and worked my way all over the convention center floor. When the foam settled and the kegs started blowing, I had gotten about as much out of the festival as one man could. I won’t bore you with the details of my route around the fest. 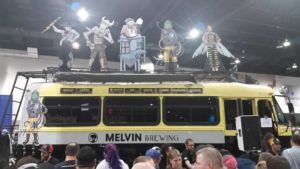 However, I do have my three biggest highlights from GABF. 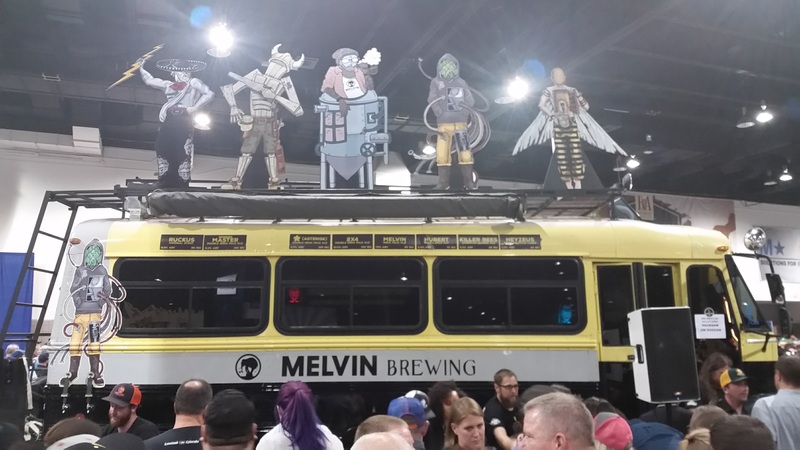 I knew that my first GABF would be memorable. 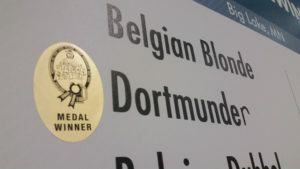 However, when Lupulin Brewing Company took gold in the Dortmunder category and I got to go on stage with them to accept the award, I nearly lost it. Seeing the pure and unbridled joy from the Lupulin team is something that will stay with me for the rest of my life. The crew at Lupulin works tirelessly to make the best beer they possibly can. 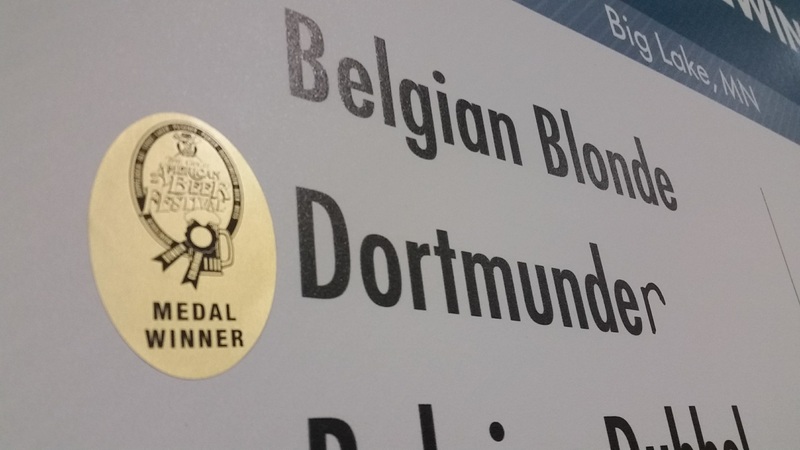 I remember tasting the Dortmunder back in the summer and Matt Schiller saying that he wished it had come out better. I thought that it was pretty good and that he was crazy. Having Aaron Zierdt jump into my arms after Lupulin was announced as a gold medal winner is something that can never be replicated. That moment, that joy, and that happiness, all stemming from the hard work, early hours, and dedication to getting better will forever be etched in my brain under the file category of pure awesomeness. I could not be happier for the Lupulin team and I was floored that I got to experience that moment with them. I was constantly keeping my eyes peeled for familiar faces. However, in a crowded convention center where 60,000 people are milling around, that is easier said than done. I was lucky enough to run into a handful of blogger friends which made me smile from ear to ear. I cannot say how much I respect others who have been blogging about beer way longer than I have. Since the Beer Writer and Blogger Conference back in August, I have had the joy of getting to know these folks. 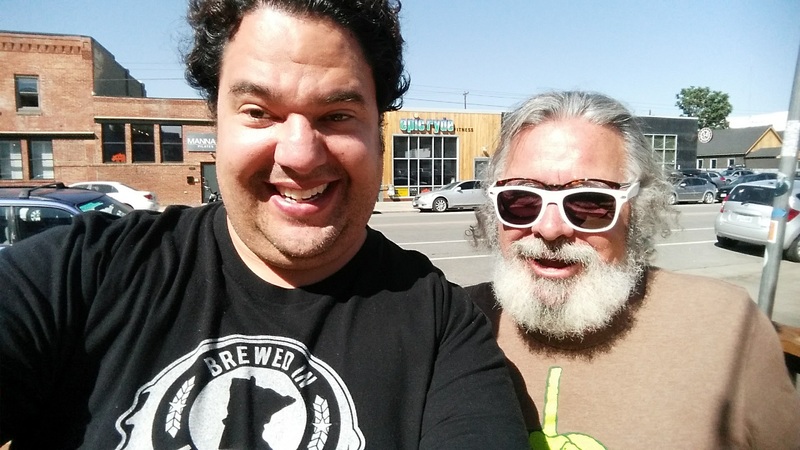 Before I even got to the festival, I found Jeff Bowles, AKA Huck at Our Mutual Friend Brewing Company in Denver. He was hanging out on the patio and it was fun to hear his friendly drawl again. He was the first person that I met back at the Beer Bloggers Conference in Milwaukee. Huck is always on the lookout for good beer and I knew OMF would be solid since he was there. We got a pic and then he was off to a few more places before the festival. Greg Washington, better known as Daddy Porter, stopped by the Lupulin Booth when I was pouring. Greg is a big teddy bear. In Milwaukee at the Beer Bloggers Conference, we had some great conversations and shared many laughs. Being able to greet him again, shake his hand, and pour him a beer warmed my soul. If you want to check out more of Greg’s work, check out his website and his FB group! I also had my eye out for a local Colorado beer blogging duo, Jeff, and Christina Estes. Th ey run, Bottle Makes Three, a Colorado Beer Blog. I met them on the first night of the Beer Bloggers Conference and we have been friends ever since. Jeff is a gas, his humor and dry wit only seem to get better as you get to know him. Christina is a warm and kind person whose smile is contagious. We randomly crossed paths as I was meandering around the Pacific Region of the convention center. You would have needed a pry bar to get the smile off my face after running into these wonderful people. We got a picture and I will see them again next summer at the Beer Bloggers Conference in Virginia. After visiting Verboten Brewing and Barrel Project a few days before, I knew I had to stop by their booth at GABF. Josh Grenz, a co-owner and head brewer at Verboten was pouring some delicious beers. The one that he told me about at the brewery was a barleywine that was fantastic. Josh is a great person and does wonderful work at Verboten. I highly suggest checking them out if you are ever in Loveland. 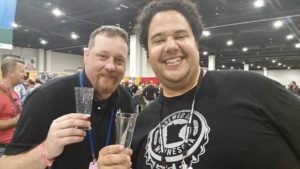 Speaking of great people in the Loveland, CO, beer community, Aaron Heaton, a co-owner, and head brewer at Grimm Brothers Brewhouse stopped by the Lupulin booth while I was pouring. I had given him a heads-up that I would be pouring for Lupulin when I stopped by Grimm Brothers during my day in Loveland. It was an absolute honor to proudly pour him a beer that I played a small role in brewing. My smile probably gave away how excited I was that he took time to stop by the booth. For him to take the time out of being at his own booth to stop by meant a lot to me. Before the festival, I spent a night in Fort Collins and reconnected with a friend whom I met when I was out there a couple years ago. In my phone, he is listed as South Carolina Dave. We met for a beer and he is a beer trading partner I have had for several years. He had some beers for me to bring home and we enjoyed a pint at the Horse and Dragon Brewing Company. Over the years, Dave and I have stayed in touch and chatted about sports, beer, and life. I was ecstatic to see him again and I cannot wait to send him more MN beer in the mail! The Great American Beer Festival was a great time. Between the What The Funk Festival, the night before the festival kicked off, to getting to spend some great time with my cousins-in-law, the trip will go down as a once in a lifetime adventure. I can only hope that someday, I will be able to participate in this beer event again. 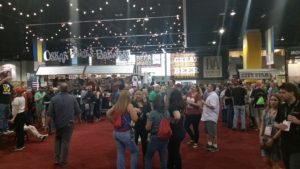 Until then, the memories and pictures will remind me of the time I could not wipe the smile off my face at the Great American Beer Festival in Denver, CO.